Well, this is the last BABE WAVE you’ll be getting for the 2011 year. 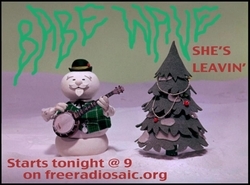 We’re only three episodes deep into this and we’re already convinced that the addition of Babe Wave to the site is definitely the best thing that’s happened in a while. This week’s episode is packed with jams about going home and leaving town and there are some total Christmas jams too. Pretty solid way to end out the year in our opinion. Plus, there’s lots of Nashville love in it and any mix that includes Link Wray’s version of “Girl From The North Country” is a hit for us. Check it out and feel groovy and get in the Holiday spirit. Number one babe, Lauren Taylor, will be in and around the Nashy area for a little bit — so if you see her, buy her a gift or a drink or tell her how much you like her digs. 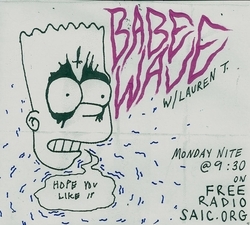 As always — you can catch BABE WAVE live every Monday night at 9PM on Free Radio SAIC. nice job on Train From Kansas City, one of my faves. Well, this is the last BABE WAVE you’ll be getting for the 2011 year. We’re only three episodes deep into this and we’re already convinced that the addition of Babe Wave to the site is definitely the best thing that’s happened in a while. This week’s episode is packed with jams about going home and leaving town and there are some total Christmas jams too. Pretty solid way to end out the year in our opinion.